Although you probably don't associate Taco Bell with flaunting wealth, you have to admit it can be dangerously easy to drop about 20 bucks on a bag of Crunchwraps, Quesalupas, and burritos if it's 1am and you're not careful. Thankfully, it looks like the fast food chain is working an all-new value menu with several options for less than a dollar. 89 Cents: Flamin' Hot Fritos Taco, Queso Bean Burrito, and Veggie Tostada (all three are new). 99 Cents: Queso Beef Burrito (new), Queso and Chips (new), Shredded Chicken Mini Quesadilla, and Beefy Fritos Burrito. 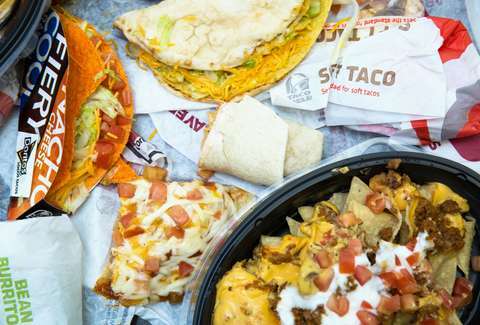 While there's currently no official word from Taco Bell on its plans, hopefully the cheap new menu will roll out nationwide sometime soon. Of course, it's unlikely that you'll see such low prices in markets like NYC, where fast food value menus are more expensive. We reached out to Taco Bell for more information. Tony Merevick is Cities News Editor at Thrillist and hasn't had those cinnamon twists since he was a kid. Send news tips to news@thrillist.com and follow him on Twitter @tonymerevick.